With some easy to understand examples! Let’s take the headache out of this confusion! Many times, “Code of Ethics” and “Code of Conduct” are used interchangeably. But hold up. There are slight differences. Each has their slight nuance… doesn’t everything? A Code of Ethics lays out a company’s and its leadership’s decision-making. A Code of Conduct lays out the do’s and don’ts of employee’s actions. Both represent two common ways that companies self-regulate. Each are typically associated with large companies, and provide direction to the company, and its employees, to help establish a public image of good behaviour. But really, a ‘Code’ can benefit any sized company. After all, wouldn’t any company want to establish a great public image with good behaviour? Code of Ethics – the organization is committed to protecting the environment and being a ‘green’ company, so employees should make the most ‘green’ decisions possible when faced with problems. Code of Conduct – don’t leave the kitchen tap running hot water while you wait for your Lean Cuisine to cook in the microwave. A Code of Ethics is sometimes referred to as a value or principal statement. It’s typically shorter in length than a Code of Conduct, and is a little more generic in content. It’s meant to give direction to a board of directors and provides general principles to help guide behaviour. A Code of Ethics may simply state, ‘any director shall not engage in criminal activities’. This publicly disclosed document works on the basis of “treat others as you would like to be treated.” When faced with ethical dilemmas or debatable situations, what’s articulated in the Code of Ethics can help guide decision making. The Code of Conduct adds all the flavour to a Code of Ethics. If in the Code of Ethics, directors must eat potatoes for dinner, then the Code of Conduct states those potatoes must be roasted with salt and pepper. This document is generally longer in length than a Code of Ethics and gives specific examples of acceptable behaviour. It’s also geared towards employees (although board members and senior management aren’t immune to its specifics). In other words, everyone must have salt and pepper with their roasted potatoes! If, as above, the Code of Ethics states that any director shall not engage in criminal activities, the Code of Conduct will lay out exactly what a criminal activity is. For example, no employee (or director) shall be in the possession of illegal drugs, or influenced by alcohol. Another example would be, a Code of Ethics may state that directors may not bring harm to employees, vendors, clients, etc. The Code of Conduct would more specifically state that no employee may discriminate against someone due to their religion, marital status, gender, race, etc. The Code of Conduct outlines specific behaviours that are required or prohibited as a condition of ongoing employment. Codes, along with other measures, have helped some companies dig themselves out of very deep holes, and have helped many companies build a healthier work climate and reputation. There are similarities between a Code of Ethics and a Code of Conduct. They are both used in an attempt to encourage specific forms of behaviour by employees and the board. 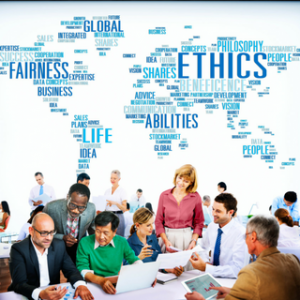 The guidelines behind ‘ethics’ are there to provide guidance about values and choices that influence decision making. Regulations behind ‘conduct’ state that some specific actions are appropriate, others not so appropriate. In both cases, the organization’s goal is to lay out an acceptable range of behaviors from all employees. But the differences are in the details. Both are used in an attempt to regulate behavior in very different ways. Ethical standards are generally wide-ranging and non-specific. They are designed to provide a set of values or decision-making approaches that enable the board to make independent judgments about the most appropriate course of action. Conduct standards generally require little judgment; here’s what you can or can not do. You obey or incur a penalty, and the code provides a fairly clear set of expectations about which actions are required, acceptable or prohibited. Many smaller businesses can survive without a formal code of ethics or code of conduct. If a business has 1-10 employees, generally everyone is talking with each other and interacting with each other every day. So communicating appropriate behaviour is much easier. However, as smaller businesses grow their employee numbers, ethical hazards and risks can increase, so having these documents, a Code of Conduct to start, can help shape cultural expectations about behaviour. And they also serve as a solid marketing tool for potential business partners or clients. Either way, whatever type of Code an organization chooses to employ, it’s critical that it is treated consistently in every instance of wrongdoing. The Code needs to apply to every employee from the ground up, and no matter how small the violation, appropriate discipline needs to take place. For example, if your Code stipulates that theft of company property is prohibited, and an employee takes home a pack of post-it-notes from the supply inventory, well, technically that’s theft, and should be treated as such. Although in this case a stern talking to might suffice. 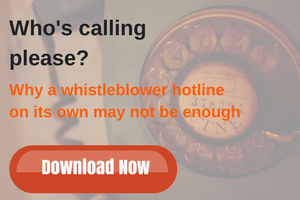 Check out our newest eBook: why a whistleblower hotline on its own may not be enough.